Many engaged couples travel a unique path leading to their wedding day. Brides and grooms seek elements for their wedding to reflect that particular journey, leading to a boom in the custom-made bridal market. The 2011 Engagement and Jewelry survey from the Knot Market Intelligence and the XO Group Inc. cites that nearly twenty-six percent of brides and sixteen percent of grooms seek custom-made engagement rings. With that said, The New York Times recognizes us as a leader on personalization for millennials. We feature a wide array of bands in gold and platinum to pair with diamonds and gemstones to specifically match the special tastes and aspirations that lead every couple to this magical moment. The floral inspired ring is ideal for the romantic bride - from the diamond encrusted pave petals that supports each stone, to the finely sculpted and organically marked mountings - the setting is feminine, elegant and stylish. 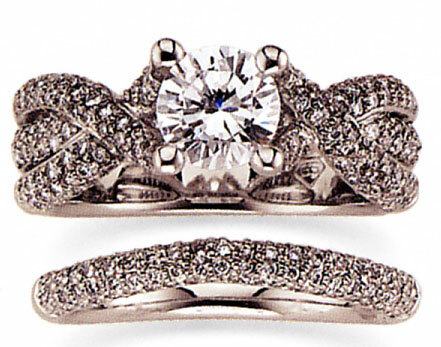 The ring pictured above is an antique style semi-mount ring with round diamonds and milgrain trim in 18kt white gold. We love the floral design - do you?